Wow! Excellent castings. These will look great! These days they *are* very well done, as opposed to the almost unrecognizable lumps of resin you used to get in the early days of the garage kits. That $10.00 sticker was for all three houses, plus the Berlin House below. That's all.... except one more I forgot: Hobby Boss 1/72 scale Merkava IIID (LIS). I haven't got any pics of it yet but I'll try to get one up later. You can see how it works in the "Maddog Manufacturing" Thread. Thanks all for looking in. Now if I only had the tabletop space to place all these! Finally got around to buying the AFV Club M60A3TTS to go along with the M60A1. Looks to be a superb kit. Excellent score Rob! Way to go! It has already been started and I'm close to finishing it. Feel free to check it out in my Maddog Manufacturing Thread. Until I finish my shopping at Amazon this is it. Thanks for looking in. Well, technically Santa bought it for me, but since Santa and I use the same checking account it qualifies. For those who don't recognize it , it is a Paasche air eraser. Basically a tiny sand blaster. I am going to use it to soften the finish on some aluminum parts I am making. Santa was really good to me this year. From the wife, a book on the Viet Nam War, a book on the BAC TSR2, and a Zactomodels update set for the MRC 1/35 OH-58D Kiowa Warrior, the new KITTY HAWK AH-6 Little Bird and the Squadron book on the F-104. From my daughter; Revell Germany 1/48 GR4 Tornado, 1/72 MV-22 Osprey, Sanding pads, AMT Rocket set, Flexible Tamiya tape and a paint mixer from Badger. My son sent me a Hobby Boss 1/72 Seahawk. My daughter's boyfriend got me a modeling visor that has a built in LED light and has 6 different lenses along with a small part picker upper and some new glue. I was stupefied with all of this stuff this year. I thank them all. This technically qualifies as a Christmas gift--from me to me. 1/48 Hasegawa Lockheed TF-104G company-owned demonstrator "Free World Defender" flown for speed records and sales purposes. The Dutch eventually acquired this aircraft. I ordered it in September when its release was announced, and it came in just two days before Christmas. I put it on the gift pile. I refound Monster Dork Studios on Etsy, and picked up his take on Cookie Monster - COOKIE! Finally Space Cadet Models released kit #2, A kit of Pioneer 2 and 4. As of now Space Cadet is only on Facebook, but they have their page set to Public so no one has to join FB that doesn't want to just to have a look. As a fan of the vintage space craft, I'm looking forward to getting to these. I gotta get one of those. Model Monkey recommends it highly for use on his parts to smooth the surfaces. Those spacecraft look tempting. After seeing your last WIP, I may have to start collecting these. Brilliant scores guys! It's so great to see everyone had such a great Christmas. Nice! They're not horribly expensive and this one is the "new improved" model. The media isn't cheap though. I just bought two 5 pound jars of Paasche blasting medium(one fine, one course) and they cost me $45 delivered from Amazon. But 5 pounds should last a while. The mailman has been making stops with boxes the past few days. 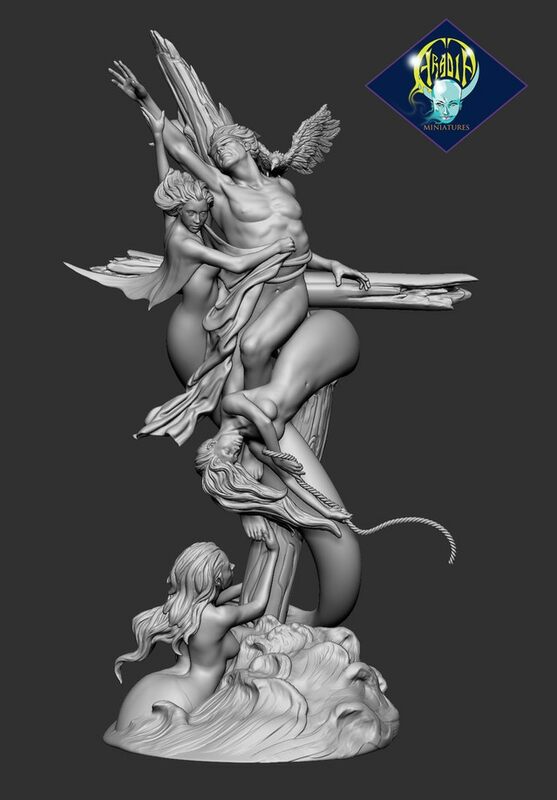 The first offering is the result of Aradia Miniatures Kickstarter campaign. eventually all these minis plus ones I didn't choose will be available on their site. Shipping is from Italy but as a customer for a few years, I've never had any problems with delivery. Leaving the Circles of Hell, I move on to a Galaxy Far away with Bandai's Blue Squadron X-Wing from Rogue 1. I loved Rogue 1 and it moved to one of my top 3 star wars movies. Thanks for looking. Those are some awesome scores Kevin! They will be fun to watch. Well, the final Christmas presents finally arrived and here they are. I've already started one of the Mitsubishis. This looks like it'll be a fun one! Picked up this old reissue kit at Michael's using a 50% off coupon. Ran me $14.83 with tax. Not sure why I've been building cars lately, but I'm having fun. Looking good Robin! I like it! 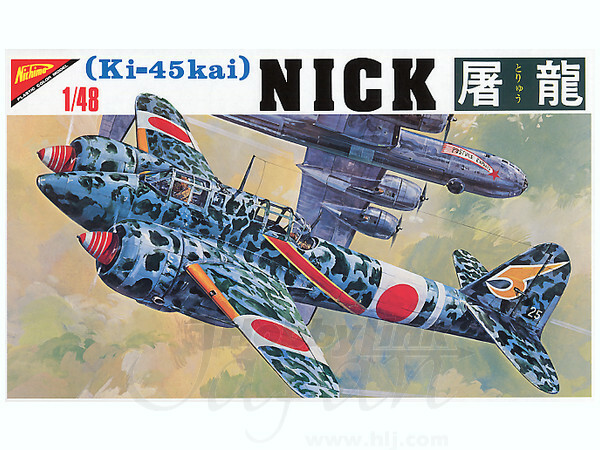 I recently acquired a 1/48 Nichimo Ki-45 Nick on Ebay for $12. I built one back when they first came out in 1979. I always like the kit and when I saw one on Ebay at a bargin price, I grabbed it up. Excellent! That will look great going together. Now I have enough buildings to build a small town! LOL! Now that I have that second Death Dealer, I can start building that one and preserve my San Diego Comicon exclusive! Thanks James! Now to figure out what version to do. Man, I want two more now! LOL! Well, that's it for now. I'll be busy for awhile just working on some of these. I did start some of them; you'll see them in the "Maddog Manufacturing" Thread.